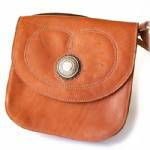 Brown leather flap-closure purse with a stitched pattern surrounding a concho with a barbed wire pattern. The flap of the purse was deliberately cut from leather marked with healed cuts and other scars. Full leather lining, interior zippered pocket, key leash with snap, and zippered front pocket. Solid brass hardware. The main compartment is about 8" wide, 7" tall, and 1 1/2" deep. It is large enough to hold a checkbook wallet, Kindle Fire, an average size e-reader, or most smart phones.